It's one of the most iconic hotels in London; a grand and gothic 5-star palace that interlaces Victorian splendour with contemporary style and service. 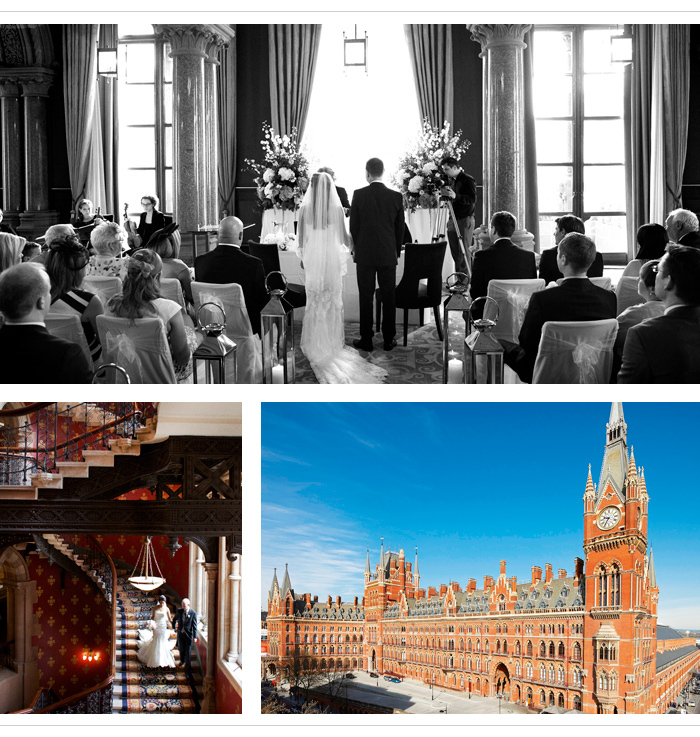 The fairytale façade that Sir George Gilbert Scott once designed for Midland Grand railway is now St. Pancras Renaissance Hotel, a luxury wedding venue that combines old-world sophistication with cutting edge technology, right in the heart of the city. Billed ‘London’s Most Romantic Building’ by the Evening Standard, St. Pancras Renaissance Hotel is full of elegant Gothic features starting with a spectacular glazed entrance hall where Victorian high society once stepped out from horse-drawn carriages, and the stunning grand staircase – an epic setting for wedding snaps. Yes, and there’s plenty of room for guests too. The luxury hotel boasts 245 tastefully decorated guest rooms, including 38 beautifully restored and updated chambers. The hotel can even book room blocks in Barlow House, a Grade-I listed hotel extensions. The gorgeous red-bricked hotel boasts a collection of ten event rooms, and with over 1000sqm of event space it’s a serious venue contender for a big, fat Asian wedding. The largest of the rooms can welcome a maximum of 575 friends and family, while the historic Hansom Hall on the ground floor seats up to 240 for a wedding reception. The lofty spaces of the Hansom Hall creates a fantastically dramatic setting, day or night. The Gilbert Scott is a bar and restaurant that delivers British classics with a modern twist, ideal for a stylish rehearsal dinner before the Big Day. For those looking for a relaxed drink after the ceremony, the Booking Office Bar & Restaurant is an informal space with a late licence until 3am, allowing you to toast your nuptials into the early hours. • Room for up to 575 guests, allowing you to extend invitations to all your friends and family. • Licensed for civil ceremonies, while couples can arrange for a blessing in the grounds of the estate. • The hotel’s grand staircase provides a stunning backdrop for your wedding photographs. • Exclusive wedding packages available as well as bespoke experiences.